The border between Finland and Russia offers a unique§opportunity for evaluating human impact on§agricultural environments. Large areas of Karelia§across the border were under similar management§regimes while belonging to Autonomous Finland and§Finland, but after the Second World War (1944),§Karelia was divided by the present border. 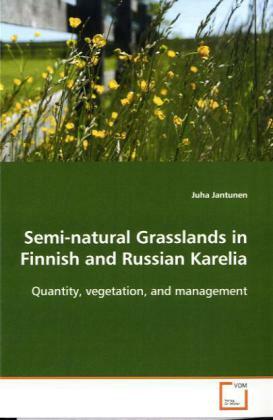 Since§then, the history of agricultural management differed§between adjacent areas in Finnish and Russian§Karelia. In Finland changes in agricultural practices§during the 20th century have led to a dramatic§reduction in the number and area of semi-natural§grasslands. The maintenance of these species rich§plant communities can be ensured by grazing or hay§cutting, but half of the remaining sites in the§province of South Karelia were abandoned. In§addition, only a fraction of the sites, still in use,§were sustainably managed. In Russian Karelia changes§in agricultural practices have taken place on a much§smaller scale. This book summarizes the effects of§different agricultural practices on the abundance of§semi-natural grasslands and their vegetation in the§border district of Finland and Russia.